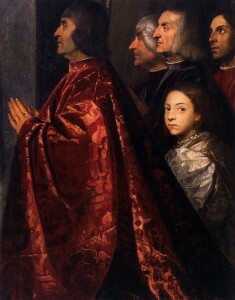 Here’s a detail from a famous painting by Titian, housed in the Frari church in Venice. Would this make a good cover for the book? Looking for her ‘rolling stone’ son in Italy, an English widow encounters disturbing revelations and then begins a dangerous romance with a charismatic Sicilian prince.